MOHALI, India, CMC – A typically explosive half-century from Chris Gayle topped an equally brutal innings from Mahendra Singh Dhoni to pave the way for a four-run victory for King’s XI Punjab over Chennai Super Kings in a tense finish to their Indian Premier League match yesterday. After Dwayne Bravo got a single from the first ball, Sharma delivered three dot balls in between a wide, a square drive for four from the third ball and a straight six off the last ball of the match for Dhoni. Earlier, Gayle shared 96 for the first wicket with India international KL Rahul before he was caught at short fine leg off former Australia all-rounder Shane Watson in the 12th over to leave RCB 127 for two. None of the remaining RCB batsmen could match Gayle’s dynamic hitting and they raised just 68 from the final eight overs – but it proved just enough. 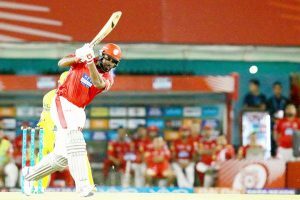 Scores: Kings XI Punjab 197 for 7 (Gayle 63, Rahul 37) beat Chennai Super Kings 193 for 5 (Dhoni 79, Rayudu 49) by four runs.